Abu Dhabi, United Arab Emirates, 10th of May 2017: Held under the patronage of His Highness Sheikh Mansour bin Zayed Al Nahyan Deputy Prime Minister, Minister of Presidential Affairs of the UAE, H.E. 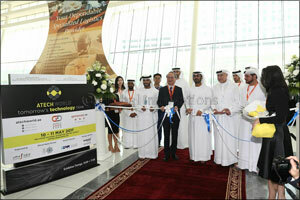 Hussain Ibrahim Al Hammadi, Minister of Education, inaugurated today the 1st edition of ATech World Conference & Exhibition and the World Game Expo, which is held at the Abu Dhabi National Exhibition Centre – ADNEC. After the traditional ribbon cutting ceremony, H.E. Hussain Ibrahim Al Hammadi along with a number of key officials and industry leaders have toured the exhibition area where they were introduced to the latest technologies in Virtual Reality, Internet of Things - IoT, Online Games, Application Development, Wearable Techonology, Artificial Intelligence – AI, VR, Interactive Entertainment, and Smart Solutions. Parallel to Ateh World, the 10th Global Hackathon Series will be held where 70 contestants will have to develop an application during 36 hours . ATech World Conference & Exhibition and World Game Expo are organized by INDEX Conferences & Exhibitions, member of INDEX Holding and, both events are scheduled to run until 11th of May 2017 at Hall 2, ADNEC.